From my Soy/Somos series, a real-life collage of Latinos in the USA. You can read the introductory post here. Soy/Somos: We are Many. I am sitting at a round table across from a pretty brunette, 24, with a ponytail set high on the crown of her head that flips from side to side when she's expressive--which she is a lot of the time. There's a blackboard in the room and windows to the parking lot sea below. (I'm in Silicon Valley after all.) The girl wears boxy eyeglasses not too different from mine, though mine hide wrinkles. Hers look like a prop, what a model might wear, like a hat. "A couple of things have been stirring up in me since you wrote to me, she says. My experience growing up...how I was then and who I am now... "
I'd reached out to a friend who works at a technology company. I'd be traveling to Northern California and wanted to interview someone in the video arts, a Hispanic. "I have the perfect person," he said, "her name's Karla. Karla draws on the computer to create images like those in Pixar movies." "You see, I didn't know any English," Karla continues. My parents came to this country with strong Spanish but no English. My dad left Cuba when he was 13. My mom moved from Puerto Rico to California when she was in her early 20's. Got her Bachelors in Puerto Rico, all in Spanish. "At school I was the odd one out. All I would see were body language. Gestures. Miradas. I cried to stay home with my parents. It was very difficult for me. I was at Ponderosa Elementary School in Santa Clara. It was kind of me and my sister on our own. "Every time I went to class my heart would start pumping. Reading and writing were a concept I could never get. I had to plan ahead. Now this person is reading this. I have to practice before my turn. I would really stumble. English was everywhere. I would memorize a few things to kind of skip and be as fast as the other person. I wouldn't tell anyone! "Years later my mom worked for First-Five as a social worker. First-Five was a company that considered that the first five years were the most important in a child's life. Karla smiles. My mother's English became pretty fluent while I was in middle school; she was taking classes. But she struggles with English, even today. Speaks to us in Spanish. We answer in English. What I think is really helping her now is Facebook. "I almost didn't graduate from elementary. My mother would say, 'La Karlita...Man... I don't know how she's going to do it.' But Mom went to the school and convinced them to move me to middle school. There was a Special Ed program in sixth grade. You had to take a test in reading comprehension. Reading three-page stories and answering questions. Or write an essay. This would determine if you were capable in reading and writing. I always failed it. They diagnosed me with dyslexia. I see it as actually not learning English from the git go." "Perhaps you had dyslexia, Karla. But you were missing a huge chunk there. You were missing a basic comfort in English that you didn't get early in your life." "My teacher at the Special Ed program was Ms. Dunn. She gave me great encouragement Every morning the school made announcements on the loudspeaker--sports and other things. Once a month they would name the "Student of the Month." Each teacher would pick one student, usually a student with straight A's." Karla has to stop while she is telling me this story. She is holding back tears. Her lips stretch and her cheeks tighten. We stop for a while. "When I heard my name on the loud speaker: 'Student of the Month, Karla....' I felt, Hey Karla, you are beginning to succeed. After that I strived for the honor roll. You got a sticker for the honor roll. That was an average of 3.0 to 3.54." "Karla, if you can remember the first few years when you were lost--what happened with the other kids? I mean you are white; you don't look like the typical Mexican American that you see here in California. Did you feel different? Did you have any problems with friends over this?" "Absolutely no feedback in California. I am Puerto Rican. OMG my friends thought that was cool. I grew up with J.Lo [Puerto Rican] and Christina Aguilera. Those were the top artists." Karla continues. "Science was fun but it involved more reading. History was a struggle. I absolutely loved Math. There was a right and wrong. It wasn't the hypotheses, or what ifs, or expand on this. When I read I see shapes. I can visualize. The numbers were symbols rather than numbers. They were graphic." Karla goes to the blackboard and picks up a piece of chalk. 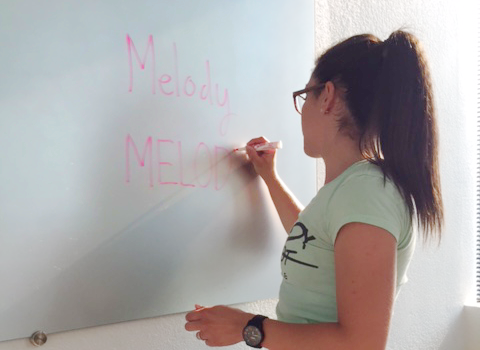 She writes the name 'Melody' in upper and lower case and below it in solid, upper case. "For me, the 'Melody' upper and lower case is much easier to 'read' than the solid 'MELODY.' The pattern forms a picture in my mind." She draws an outline around the first 'Melody' to show its shape. "When it comes to art, when I was little I would draw any image I saw and would show my parents. They'd go, 'Wow.' I could translate what I was able to see with my eyes to my hand. I always added art to my projects--realistic and clean and polished. What kids thought was cool. In school we had to build a model of a mission. I did that but also added a 2'x4' charcoal drawing of the church. I played video games. My much older brother was an artist. I wanted to be like him. You can see that fear pushed me to do better in other things. Another way of giving me importancia." Karla, I find that you are accurately verbal. I feel that you compensated in that way too. It didn't stop you from expressing yourself well. "But when I write e-mails today I always put visuals. For example, if I have a problem with an app I'll take a photo of it and list my points. If a colleague texts me with questions, I'll go over to her desk to talk to her." "Face to face communication!" I laugh. "What a problem!" "In 8th grade I decided I wanted to be a game designer. In high school I took Art electives, Fundamentals, Sculpting, CAD - 3D shapes I could see. You are given the top and the side views. Art with the numbers. I was like the TA. 'Help these students here.' Senior year I did Video Production. When I graduated I said to my mom, 'Mom, I'm going to art school.' But she took me to see a Christian college and somehow I got enrolled. It was a great experience religiously. When I went to that school it taught me: God, what do you want me to do? Instead of, what do I want for me? "From my sophomore year on I went to the Art Institute in Sunnyvale. I got straight A's. Everything they were teaching I was able to comprehend. Even English. Two years into the school we had a 3D project for a whole quarter. I chose to work on the movie Transformers which had just come out. Se estaban burlando de mi... (they would laugh at me...) Lo que pasó fue... I put 3D on a screen. When I completed it, todos se quedaron like Oh, my gosh! The professor displayed it on the screen. People were talking...The Director of the department got a call from the company I now work for. They were looking for an intern. I interned with them for two years. I've been with the company since. Two years an intern and two as a full-time artist." "Karla, would you explain your work?." I work with an art director and three other artists." I could call myself a 3D generalist. I am given a chunk of the desert, for example. I build the terrain. I prepare the assets: lighting, color, composition, environment. But my father sees me working and says to me, 'How are you young people going to make it?' We see rents here in Silicon Valley. They are crazy." "Karla, I have a different kind of question for you. Do you self identify as a Latina? Do you connect with other Latinos?" "People think Latina translates to Mexican here. They say, 'Do you speak Mexican?' With politics as they are and all that, I feel that if I were Mexican I would have to be careful. It's sad. I worry.